How do I know if I have blepharitis? The edges (rims) of the eyelids are red and the eyelashes are stuck together by tiny crusts. The whites of the eyes are often red and sore. In the mornings the eyelids stick together, sometimes with a yellow discharge. These changes cause the eyes to be sore and irritable, with a gritty foreign body feeling. Watering due to the reflex production of excessive tears is common. Seborrhoeic dermatitis – a common scaly skin condition. This typically causes dandruff and sometimes a rash on the cheeks and forehead. Rosacea – a skin condition that typically affects the cheeks and nose. Symptoms include facial flushing, facial redness, and red spots. Eczema (atopic dermatitis) – an itchy inflammation of the skin which tends to flare-up from time to time. It can be associated with allergies. 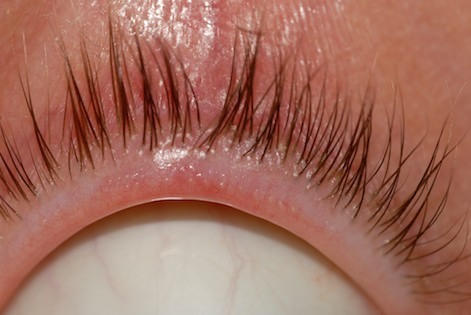 Tiny dandruff-like flakes form along the bases of the eyelashes. Bacteria invade the flakes and cause anterior blepharitis in some people (see photograph below showing severe anterior blepharitis). Seborrheoic dermatitis, which typically causes dandruff, can also cause these flakes to build up along the eyelid margin. (See photograph below). 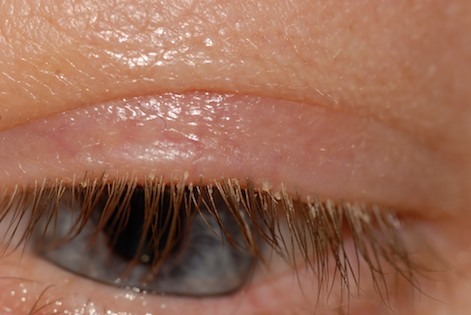 A row of special glands in the upper and lower eyelids (the meibomian glands) secrete an oily substance that coats the tear film and maintains its stability over the cornea in between blinks. In some people the ducts of the meibomian glands become blocked. This results in meibomitis. (See photograph below). No, it is not serious, and only very rarely causes any permanent damage to the eyes. 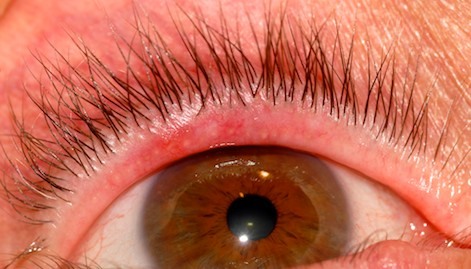 However, blepharitis is a very persistent problem. 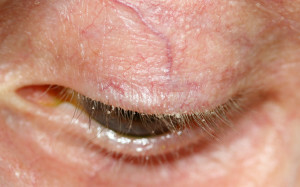 (Blepharitis which is confined to the eyelid(s) on one side only should, however, be viewed with suspicion as very rare tumours can mimic blepharitis and lead to a misdiagnosis). Yes, though treatment usually can only control the problem and cannot eradicate it altogether. Eyelid hygiene is the mainstay of treatment and should be performed twice daily for the first 2-3 weeks and then at least once daily indefinitely to keep the inflammation under control. Massage the eyelids with your forefinger immediately after applying the heat. It is preferable to apply a lubricant ointment to the skin surface first e.g. Lacrilube ointment or Xailin ointment, both of which are preservative free. (These are ointments commonly used to manage dry eye problems or exposure of the eye in patients who cannot close the eyes properly). These can be purchased across the counter in a chemist or from the Face & Eye Clinic. Massaging helps to push out the oily fluid from the meibomian glands which helps to stabilise the tear film on the surface of the eye. Massage the upper eyelid and the lower eyelid gently towards the eye. This action should be repeated 5 to 10 times over about 30 seconds immediately following the warming. Massaging should neither to be too gentle nor too firm. It should be relatively comfortable and you should not press hard enough to actually hurt your eyeball under the closed eyelids. After heat application and massage, clean the eyelids. Blephaclean® wipes used twice daily for 1 or 2 weeks are an excellent way to achieve rapid control of blepharitis. (These wipes are particularly useful in removing eye make-up, avoiding irritation/allergy associated with other eye make-up removers). Blephasol® solution on a cotton bud once daily can then be used as daily maintenance to keep the eyelid margins clean. 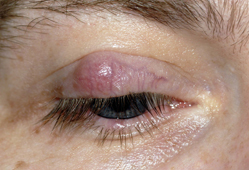 In severe blepharitis a topical antibiotic (e.g. Chloramphenicol ointment) can be applied to the lid margins after performing lid hygiene for a period of 2 weeks. This can reduce the bacteria contributing to eyelid margin inflammation and make it easier to control blepharitis using the treatment described above. Ointments/drops containing steroids should not be used unless prescribed by an ophthalmologist and used under supervision, as topical steroids used inappropriately can cause cataracts, glaucoma and can predispose to infection. Occasionally if posterior blepharitis cannot be controlled with local treatment as described above it is worth considering a 6-12 weeks course of oral Doxycycline (typically 100mg taken orally once daily) as this can reduce the inflammation associated with blepharitis. N.B. This cannot be used during pregnancy. Since blepharitis causes tears to be abnormal, artificial tears can give relief from irritation, even when your eyes are watering (eyes can water as a reflex reaction to a basic dry eye problem or tear film abnormality). These should be used at least 4 times a day at least to prevent symptoms rather than to just relieve symptoms. There are a large variety of artificial tear preparations to choose from. It is essential to use preservative free drops. Preservative free drops examples: Hyabak drops, Hylotears, Hylo Forte, Theoloz, Systane drops preservative free, Viscotears preservative free, Celluvisc or Liquifilm tears preservative free. These can be ordered from: www.faceandeyeshop.co.uk (eye products). To learn more about Blepharitis, please contact us at today to schedule an appointment.